The concert takes place at FSU’s Opperman Music Hall at 7:30.
and you can look at the score, published by Theodore Presser Co. here. Order the CD that includes Dark the Star, plus three other vocal works of mine, at the Bridge website. Tagged Bridge Records, Dark the Star, Evan Jones, Florida State University, Theodore Presser Co.
A great deal of music is packed into the three days of the Festival – go to the Festival website for more information. Here’s the first movement of Dark the Star in the Bridge recording made by the forces for whom the piece was written: William Sharp, the 21st Century Consort, and Christopher Kendall, conductor. The deeply frightening election nightmare that has descended leaves little room to talk about artistic matters. And yet, I feel I would be remiss if I did not express my thanks for the recent performances of my music in the past several days. Cantori New York and the French ensemble Musicatreize gave two vivid performances of my Mass for the Day of St. Thomas Didymus in New York City this past weekend. The combined choirs mastered the intricate layering of the piece, with its settings of both the Latin Ordinary of the Mass and Denise Levertov poems that reflect on the liturgical texts. I felt the singers had internalized the gestures of the piece and projected them to the listeners with authority and nuance. 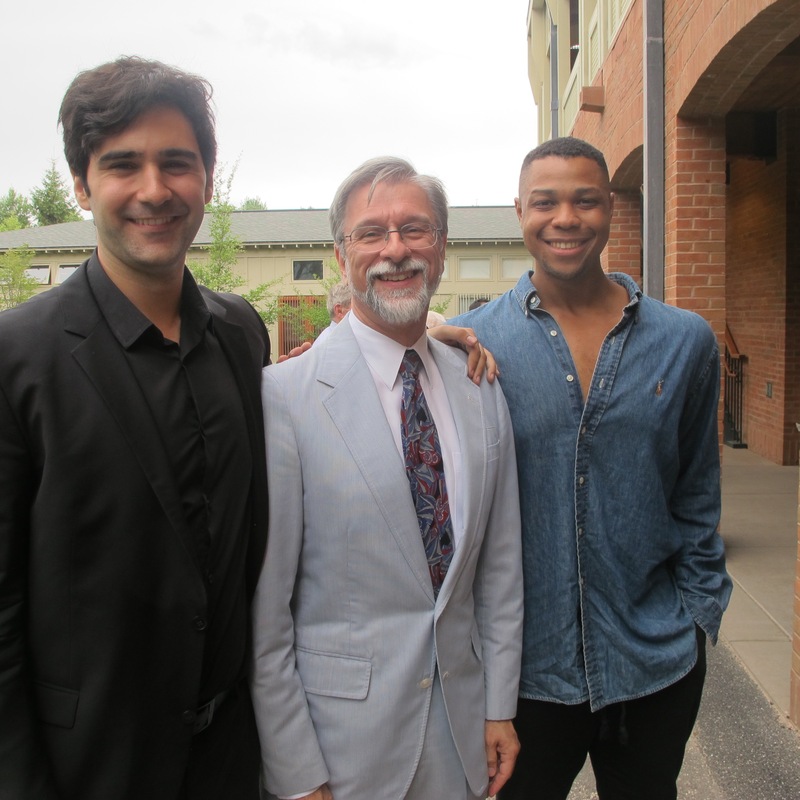 Overlapping with the Cantori concerts were performances of my Dark the Star with Baritone Tom Meglioranza and the New York New Music Ensemble This was an astonishing performance; Tom had memorized the piece, a 20-minute work that sets Rilke, Susan Stewart, and a verse from the psalms. Beauty of sound, precision, powerful affect – Tom’s singing had it all. 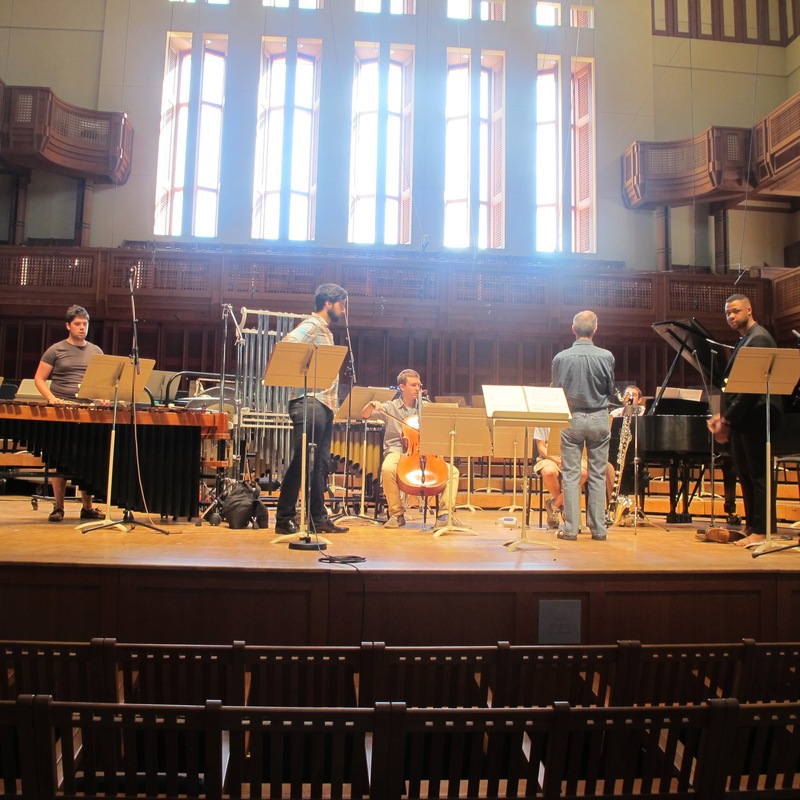 The instrumentalists – Jean Kopperud, clarinet; Stephen Gosling, piano; Chris Finckel, cello; and Daniel Druckman, percussion, with conductor Eduardo Leandro – were no less eloquent. Here are YouTube links for the pieces: the Mass as performed by The Crossing and Dark the Star with William Sharp and the 21st Century Consort, Christopher Kendall conductor. Although I was in New York and could not attend, I was happy to learn that mezzo Kristin Gornstein performed one of my Three Folk Hymns this past Sunday as part of her recital at St. Thomas Church in Whitemarsh, not far outside Philadelphia. Her pianist was Derrick Goff. Kristin was very impressive when I heard her give the premiere of Steve Mackey’s Madrigal for voice and percussion at Tanglewood in 2015, and I am delighted she has taken up my music. In addition to these performances, I want to report that pianist Youmee Kim has recorded my Pure Contraption, Absolute Gift for Centaur Records as part of an album of American piano music. Youmee was a member of the consortium that commissioned the piece, and it is wonderful to have this elegantly performed document of that project. I am not yet finding the album online; Centaur advises checking Arkiv Music or HB Direct for its products, and I expect the disc will be available soon. Poetry of Rilke and Susan Stewart, plus a verse from Psalm 116 – these are the texts I set in Dark the Star, a 2008 work for baritone, clarinet, cello, piano and percussion. 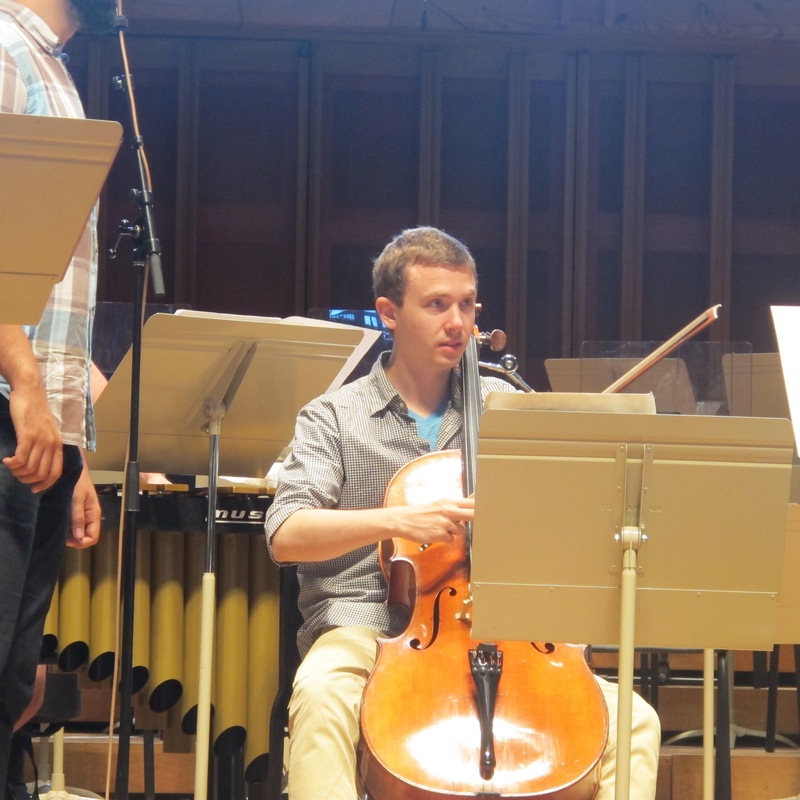 The New York New Music Ensemble with soloist Thomas Meglioranza (at left) will perform the piece twice in early November. Here are the details: the first performance is in Philadelphia on Sunday, November 6 at 2 pm. The free concert will be in Rose Recital Hall, on the 4th floor of Fisher-Bennett Hall, located on the southeast corner of 34th and Walnut on the University of Pennsylvania campus. (Make sure your clock is set correctly, as Eastern Standard Time returns that weekend!) NYNME will repeat the program in New York the next day, November 7. The New York performance is at 8:30 pm, at the Tenri Cultural Center, 43a West 13th Street. Music by Melinda Wagner, Mario Davidovsky, and Augusta Read Thomas will round out the program. I’ve been fortunate to work with the extraordinary musicians of NYNME for over 20 years. The rapport among these players is near telepathic, and their performances are electrifying. Composing this cycle of songs began with my discovery of three poems in Susan Stewart’s collection Columbarium that I knew I must set to music. The deep, dreamlike wisdom of these poems haunted me, just as I had experienced with Susan’s poem “Cinder” that had served as the fulcrum of my song cycle Holy the Firm. Eventually, texts by Rilke and an earlier setting I had done of a psalm verse were drawn into the gravitational orbit of Susan’s poems. I ordered the texts in a nearly symmetrical pattern, with two texts set a second time in versions that shadow their first readings. This is partly for the sake of the formal design, but, more importantly, to re-examine the poems in the penumbra of what comes before. Rounding the cycle in this way reflects not only the circles and repetitions in Susan Stewart’s texts, but also the way in which, as Rilke writes, the things we have let go of yet encircle us. The work was composed for William Sharp and the 21st Century Consort, who gave the premiere, with Christopher Kendall conducting. I just heard about an upcoming performance, too late for it to make it into the latest edition of my e-newsletter. (You can see the newsletter here, and sign up for future editions here.) Ensemble for These Times has programmed my From Psalm 116 for a concert at noon on October 29, 2015 at Laney College in Oakland, CA. Nanette McGuiness will sing, with Dale Tsang at the piano. From Psalm 116 was written for an AIDS Quilt Songbook concert given in Philadelphia a number of years ago by Orchestra 2001. The text is in Latin, and translates as “Precious in the eyes of God is the death of His beloved”. I later incorporated the piece into the song cycle Dark the Star, the work that was done at Tanglewood this past summer. Here is a You Tube clip from the Bridge recording of Dark the Star, with William Sharp, baritone and the 21st Century Consort, Christopher Kendall conducting. 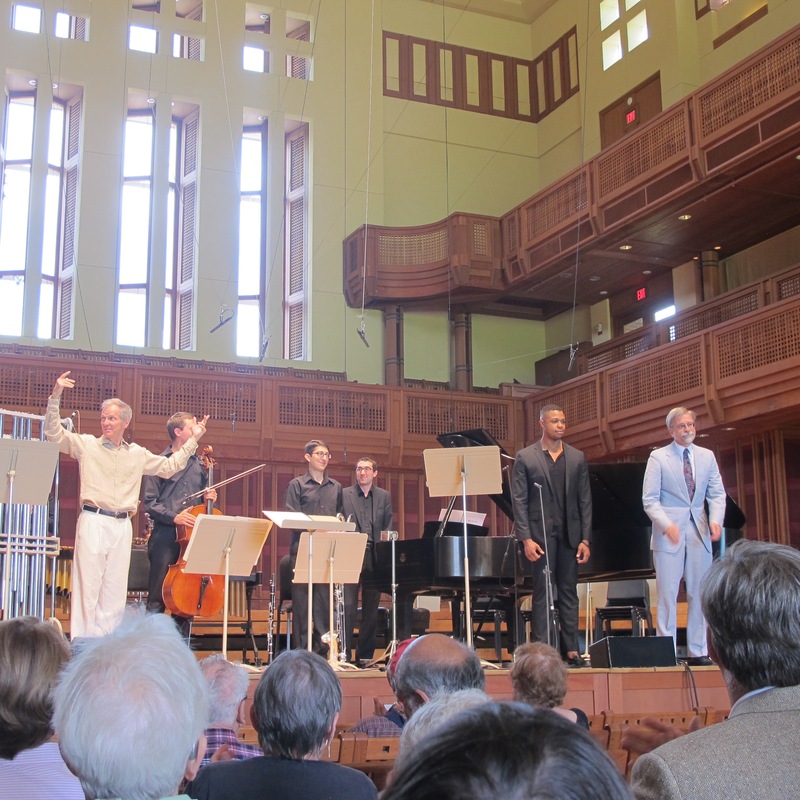 There is so much to say about the recently ended Tanglewood Festival of Contemporary Music that I have been having trouble getting started with a blog post about it all. This won’t be a complete report, just a beginning. I hope to have more to say in subsequent posts – though I really need to get back to the violin and piano piece I am working on for the Philadelphia Chamber Music Society. My own Dark the Star was performed on the Friday, July 24 program, and magnificently so. 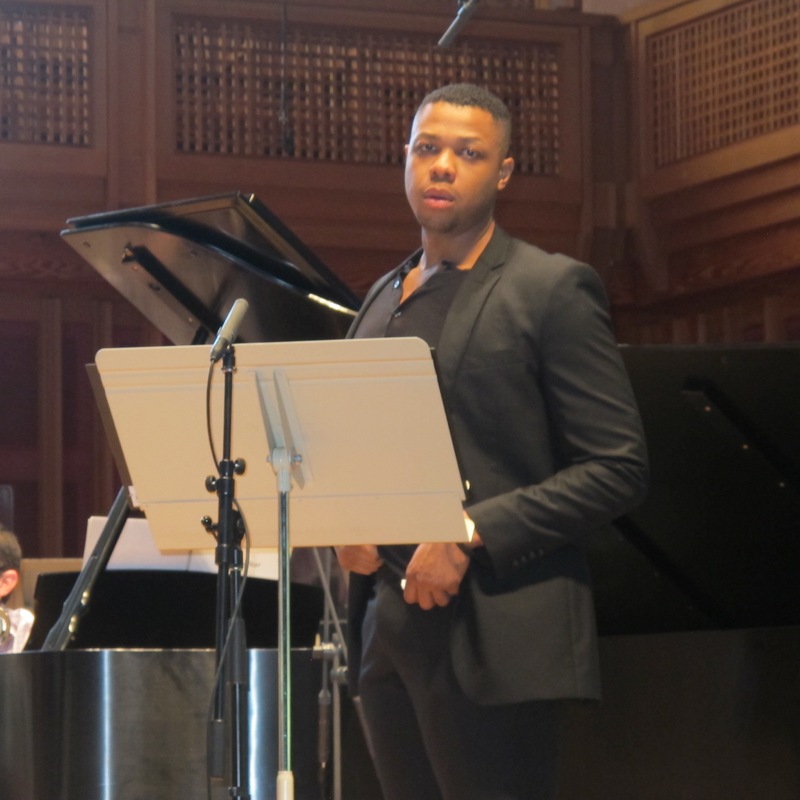 The piece is scored for baritone, clarinet, cello, piano, and percussion, but there were two superb young baritones among the Fellows – Dimitri Katotakis and Davone Tines – so the renowned baritone Sanford Sylvan, coach for the performance, devised a division of labor where the two singers alternated, sometimes even dividing up the text for a single song. I’m not going to alter the score to include two singers, but what Sandy worked out was uncannily effective. The texts for the piece are full of shadows and doubles; plus, in two cases I set the same text twice, so the double-soloist strategy made organic sense. For one phrase near the end, Davone and Dimitri sang in unison to devastating effect. The instrumentalists were superb: Ethan Young, cello; John Diodati, clarinet; Joseph Kelly, percussion; and Pierre-André Doucet, piano. The distinguished pianist Stephen Drury conducted. Dark the Star opened a well-considered program devised by John Harbison, with threads of connection among the pieces both in terms of form and expression. There was an ecumenical flavor established by including pieces with Christian, Jewish, and Buddhist roots. Sacred song, broadly defined, occupied the first half. My piece was followed by Dallapiccola’s Concerto per la notte di Natale dell’anno 1956, with a 17-piece chamber orchestra conducted by John Harbison and the brilliant Suzanne Rigden as soprano soloist. Intimate and piercingly intense by turns, the piece sets two medieval texts by Jacopone da Todi, along with an instrumental prologue, intermezzo, and epilogue. After intermission, Dark the Star‘s formal strategy of relatively short songs played without pause was echoed in the premiere of Harbison’s Seven Poems of Lorine Niedecker – in this case truly short songs, or perhaps a single song making use of several poems – played continuously and running about 7 minutes. Harbison is able to find fresh piano textures with unobtrusive and economical means, and the vocal writing is equally engaging. Soprano Sarah Tuttle was the appealing soloist, accompanied by veteran pianist Ursula Oppens. 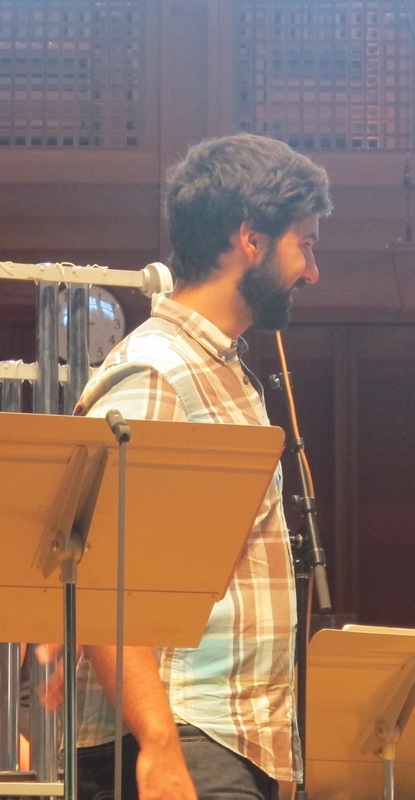 (There were several touching instances on the festival when veteran performers handed on their commitment to new music by performing alongside their more junior colleagues, including new works by Michael Gandolfi (Dawn Upshaw with singers Nola Richardson, Alison Wahl, and Zoe Band) and Yehudi Wyner (Lucy Shelton with mezzos Paulina Villareal and Quinn Middleman.)) The closing work on the program was also a set of miniatures, this time instrumental movements for a mixed chamber ensemble: Gerald Levinson’s Here of amazing most now, originally written for an Orchestra 2001 concert in honor of George Crumb on his seventieth birthday. Though not part of the composition, it worked well to have the instrumentalists speak the various haiku or poetic fragments that serve as epigraphs for each movement of the piece. New works by Helen Grime (a vibrant duet for clarinet and trumpet called Embrace) and a quartet for clarinet and piano trio by Shulamit Ran entitled (in Hebrew) Birkat Haderekh (“Blessing for the Road”) rounded out the second half. There was a sense of tenderness in the Ran, not the most common affect in new music concerts. More to come soon on the 2015 Tanglewood Festival of Contemporary Music, but for now, a link to a Times review, including mention of my Dark the Star. 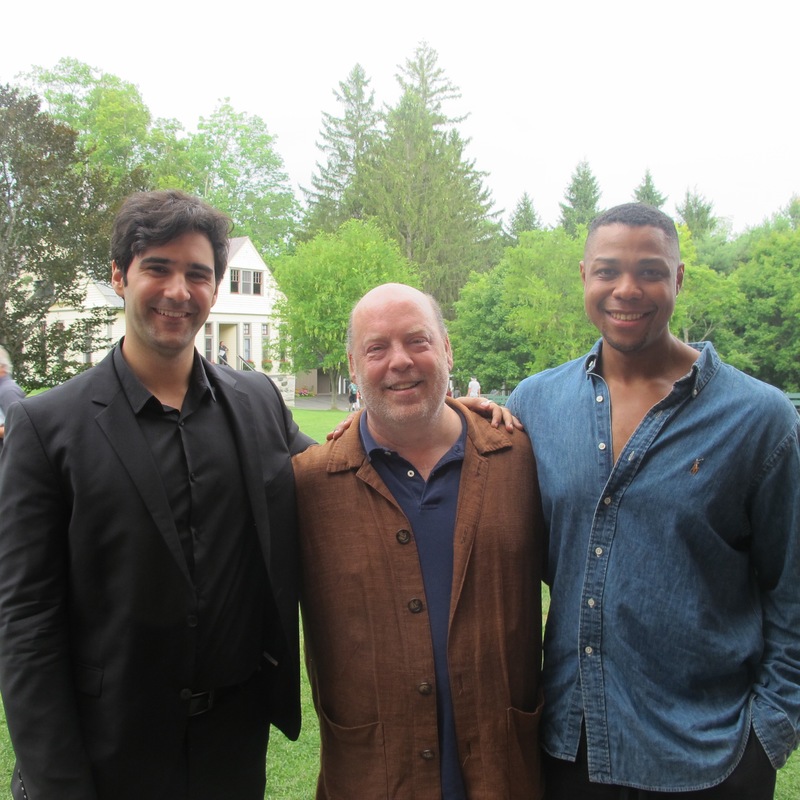 The July 24th Tanglewood performance of Dark the Star, my song cycle for baritone and chamber ensemble, is just a week away. It’s part of an attractive program, with music by Luigi Dallapiccola, John Harbison, Helen Grime, Shulamit Ran, and Gerald Levinson. The Harbison, Grime and Ran pieces are premieres. I’ll be there starting earlier in the week, so as to attend rehearsals of my piece and to catch several of the other concerts in the Contemporary Festival, as well as some of the regular programs. Highlights for me in the latter category include Paul Lewis playing the last three Beethoven sonatas and Michael Tilson Thomas conducting Mahler 5. Composing this cycle of songs began with my discovery of three poems in Susan Stewart’s collection Columbarium that I knew I must set to music. The deep, dreamlike wisdom of these poems haunted me, just as I had experienced with Susan’s poem “Cinder” that had served as the fulcrum of my song cycle Holy the Firm. Eventually, texts by Rilke and an earlier setting I had done of a psalm verse were drawn into the gravitational orbit of Susan’s poems. I ordered the texts in a nearly symmetrical pattern, with two texts set a second time in versions that shadow their first readings. This is partly for the sake of the formal design, but, more importantly, to re-examine the poems in the penumbra of what comes before. Rounding the cycle in this way reflects not only the circles and repetitions in Susan Stewart’s texts, but also the way in which, as Rilke writes, the things we have let go of yet encircle us.